The Wingle meets Euro 5 emission standards. SHANGHAI -- Great Wall Motor Co. has completed certification of its diesel-powered Wingle pickup for sale in Europe and Australia. Fitted with a 2.0-liter diesel engine, the Wingle pickup can meet Euro 5 emission standards, said a company spokesman. The company did not indicate when the truck would go on sale in Europe or Australia. Great Wall's Baoding plant launched production of the Wingle's diesel engine in August. By 2011, the plant will build up to 140,000 diesels a year. A year ago, the European Union certified a gasoline-powered version of the Wingle pickup and three other Great Wall models: the Florid and Coolbar sedans and the Hover 5 SUV. 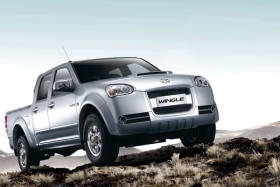 Great Wall now exports the gasoline-powered Wingle to Italy, Romania and Australia.